Irish Examiner: The UO Chamber Choir visits Ireland and wins the top prize in the Cork International Choral Festival. PBS: Journalism professor Peter Laufer discusses the consequences of up-to-the-minute news coverage and his ideas on how news should be reported and consumed. OPB: UO students will work with Medford officials and residents to tackle practical issues in the fourth year of the university’s Sustainable Cities Initiative. The Register-Guard: Eleven graduate students competed in a “Three Minute Thesis” competition using only one PowerPoint slide and their ingenuity. AroundtheO: Chemistry professor Geri Richmond presented her research on the importance of water surfaces to life on Earth at the Spring 2013 Presidential Research Lecture. 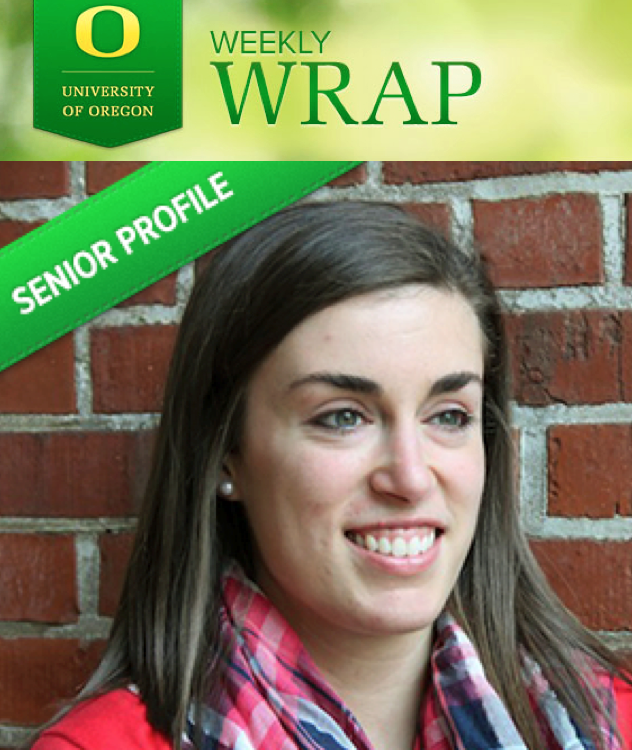 Celebrating Champions: The UO Digital Communications team has created a series of senior profiles to publish throughout spring term to highlight some of the scholars and change-makers earning degrees. Sports Illustrated: Four-sport athlete Liz Brenner has been nominated by Sports Illustrated for its Female College Athlete of the Year honor after success in volleyball, basketball, softball and track & field at the UO. AroundtheO: Autism Experts from the UO and Dr. Eric Fombonne of OHSU held the “Science of Autism” seminar May 7 to reveal the truth about autism.